Easter Getaway for-Caravaners can not stress the importance of your caravan tyres. outcome. The most common thing found on caravan tyres is sidewall cracking. This usually only comes to light when the tyre is removed, we can flex the sidewall with the tyre removed from the wheel, and this will show the extent of the cracking. This problem is due to the effect of ultraviolet light acting on the carbon black in the makeup of the tyre when the caravan is parked and is more common in Old Michelin tyres. This information also applies to motorhomes. The wheels will be checked for corrosion and the tyres will be removed from the wheels and checked for internal cuts and damage, this is most important as unseen damage can become a nightmare scenario when going down a motorway at sixty mile per hour and losing complete control due to tyre failure. The tyre dealer will then check the outside of the for damage to the tread area and the sidewalls for cuts and cracks. Also important is to check the age of the tyre, this can be easily done by an expert fitter.Tyres do become out of date after six years and are affected by ageing in the sidewalls. As stated above cracks start to form around the rim area due to the caravan wheels been stood in the Sun for long hours during the Summer months and eventually the carbon black, that is used in the manufacture of the caravan tyres, starts to break down and small but deep cracks start to form around the rim area and will eventually join up to create a very dangerous hazard, indeed this is one of the most common cause for tyre blowouts on caravans and trailers. 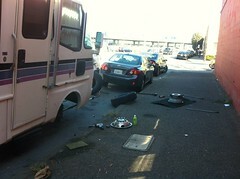 Any caravan tyres with cracks and cuts should be scrapped and replaced with a new tyre. Finally, if everything is OK the pressures and tyre valves should be checked for the correct loading of your vehicle and trailer. to make sure that the wheel set up conforms to your caravan or trailers recommended weight carrying capacity. Some of the larger heavier vehicles require more heavy duty tyres to carry the extra loading, your tyre dealer will advise you on the correct fitments by advising you fit either General re-enforced or larger ply rated ones. Tyre pressures should always be checked and adjusted when the pressures are cold before every journey. If in doubt, replace with new and correct caravan tyres. Pellon Tyre and Auto-centre offer car and van servicing and repairs to all makes of vehicles. We are members of Unipart Car Care centres and give a nationwide guarantee for all our work and parts. We also sell Caravan Tyres online from our website www.pellontyres.co.uk by using the tyre selector and choosing your tyre size. We offer courtesy cars to local motorists who need to go to work and leave their car with us for work doing. We are also an official MOT testing station and are members of Motor-codes, who carry out checks for a high standard of equipment and workmanship. Check Your CARAVAN TYRES; West Yorkshire can not stress the importance of your caravan tyres. Tyre experts recommend that owners of any trailed vehicles should remove the complete wheel or wheels .Then take them to their favorite garage or auto centre. Then have them checked by a professional member of the team. It is important that the wheels are given a thorough inspection, this will ensure the safest possible outcome. So Check Your CARAVAN TYRES . The most common thing found on caravan tyres is sidewall cracking. This usually only comes to light when the tyre is removed. We can flex the sidewall with the tyre removed from the wheel, and this will show the extent of the cracking. This problem is due to the affect of ultra-violet light acting on the carbon black. This is in the make up of the tyre when the caravan is parked, and is more common on Old Michelin tyres. This information also applies to motor-homes. The wheels will be checked for corrosion. Then the tyres will be removed from the wheels and checked for internal cuts and damage. This is most important as unseen damage can become a nightmare scenario. Especially, when going down a motorway at sixty mile per hour and losing complete control due to tyre failure. The tyre dealer will then Check Your CARAVAN TYRES, the outside of the for damage to the tread area and the sidewalls for cuts and cracks. Also important is to check the age of the tyre, this can be easily done by an expert fitter.Tyres do become out of date after six years and are affected by aging in the sidewalls. As stated above cracks start to form around the rim area due to the caravan wheels been stood in the Sun for long hours. Especially, during the Summer months. And eventually the carbon black, that is used in the manufacture of the caravan tyres, starts to break down. Small but deep cracks start to form around the rim area. This will eventually join up to create a very dangerous hazard. Indeed this is one of the most common cause for tyre blowouts on caravans and trailers. Any caravan tyres with cracks and cuts should be scrapped and replaced with a new tyre .Finally if everything is OK the pressures and tyre valves should be checked to the correct loading for your vehicle and trailer. to make sure that the wheel set up conforms to your caravan or trailers recommended weight carrying capacity. Some of the larger heavier vehicle require more heavy duty tyres to carry the extra loading, your tyre dealer will advise you on the correct fitments by advising you fit either re-enforced or larger ply rated ones. Check Your CARAVAN TYRES pressures, which should always be checked and adjusted when the pressures are cold before every journey. If in doubt replace with new and correct caravan tyres. Of course,Many thousands of people will be getting their caravans and motorhomes ready. For the British bank holiday season starting this year with the Easter holiday. Significantly, this is time when thousands of holiday makers will be checking their tyres. Including tyre pressures, ready for their first trips away. So us Brits do this every year. Even though we know that we will be stuck in massive traffic jams and hold ups. Wherever we go, but especially to the coast. Never the less we do it every year. We Brits yearn to get away over the bank holiday period and the adjoining school holidays. What we do not all do is to check our tyres and Tyre Pressures ? Tyre Pressures for carrying the weight that you have in the trailer, this will usually be the highest pressure for this type trailer. I have seen hundreds of these trailers parked up with a wheel missing. Because of the tyre blown out and the owner not having a spare the same size. If you use this type of vehicle! Then you must carry a spare wheel. So, if you are doing sixty mile an hour and you have a puncture in one of these trailers. Then the small tyre will simply disintegrate. Because of its small size and the weight that it is carrying. Of course, a spare wheel is a necessity. Also make sure that you are buying a spare wheel for a trailer, these are usually a six ply tyre that are made for highway and NOT a wheel barrow tyre. I have mentioned this because many people make this huge mistake, we have seen this many times. This is also a important thing to think about when buying a new tyre for a caravan or mobile home. Make sure that you buy the right tyre that has the correct weight carrying loads; It should tell you what tyres to use in the hand book or make sure that you fit the same tyres as your vehicles original equipment. In the motor homes the tyres are usually of a higher ply rating than normal car tyres. As we all know some of these vehicles are massive even as big as a double decker bus, so it is very important to get the exact tyres with correct ply rating and load rating, in my opinion it is always best to fit the exact same tyres, even the same makes of tyres, as your original equipment. This will ensure your safety and probably your fuel consumption. I know that our customers are on a tight budget but in this instance buying cheap tyres is not an option, if the vehicle is fitted with Michelin tyres then replace them with exactly the same using the same tyre pressures and them unless you are really unlucky you should have a problem free journey as far as your tyres are concerned. Also a good tip is to check your tyre pressures when the tyres are cold and also make sure that you have a valve cap fitted, to ensure that the valve does not leak and reduce your tyre pressures. maximise the stability of the total unit, we have all followed caravans that are swerving about doing 60 mph on the motorway. Of course, this is also illegal and dangerous. Have a safe and care free holiday ! Keeping tyres correctly inflated ensures an even wear rate leading to longer tyre life. Under-inflated tyres places excess loads on the outer edges of the tyre, causing the shoulders to wear more rapidly. Over-inflated tyres will experience higher wear rates in the centre of the tread. Eric Roberts – Hi I would like to introduce myself. So, I have worked in the Garage and tyre and I am MD for online battery company www.batteriesontheweb.co.uk. Subsequently, I have worked for a couple for national tyre companies in my younger days. Of course,before starting my first business. Now own a garage and MOT testing centre, here in the UK. As a result, called Pellon Tyre and Auto-centre. A keen blogger about anything to do with cars and their related products that will help my business. We are members of Point-S and Trading Standard UK .Finally, we are also a Unipart Car Care Centre and of course Tyre-safe.